MAVEN is a $671 million NASA mission and is expected to enter Mars orbit Sept. 21 following a 10-month journey from Earth. The mission will target the role that the loss of atmospheric gases played in changing the climate there over the eons. The mission should help scientists determine why Mars went from a warm, wet and possibly habitable planet several billion years ago to the cold, dry and inhospitable planet it appears to be today. 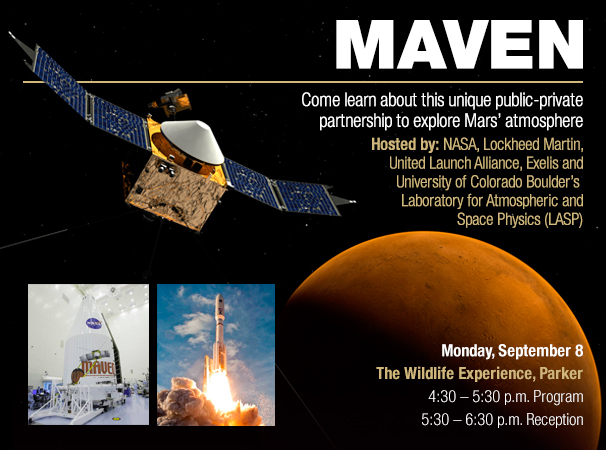 MAVEN is an exemplary federally funded university research project that has led to several key Colorado aerospace businesses playing critical roles in the design, development, launch and subsequent data collection of the high-profile mission. LASP is leading science operations and provided two of the science instruments, while Lockheed Martin of Littleton built the spacecraft and is responsible for mission operations. United Launch Alliance of Centennial successfully launched MAVEN aboard an Atlas V rocket, and Exelis, with operations in Colorado Springs, manages the deep space network used to communicate with MAVEN. The event is hosted by NASA, Lockheed Martin, United Launch Alliance, Exelis and CU-Boulder’s LASP.